How much will you donate per month? 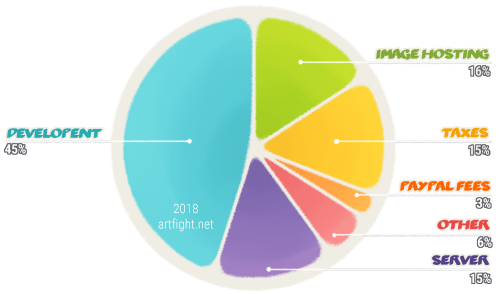 Donations made to Art Fight are used to keep our site going (and growing) strong. Donators qualify for appreciative rewards depending on the tier of their donation, including exclusive benefits on the site and on our Discord server as well as art rewards. When do I get my rewards for donating? Rewards are not automatic, so you will need to give staff some time to verify your donation. Donations are now processed once a day on the day following when the donation is made. Therefore, please contact Takaia if you haven't received your rewards within 48 hours from the time of your donation. Can I donate in small amounts over time? Donating in parts over time (from the end of the previous fight to the end of the upcoming fight) will stack, so if you want a certain tier, you do not have to donate the amount all at once. You will receive the appropriate reward whenever your total amount paid matches that of a reward tier, not before. Please be aware of your donation goals and the cutoff period for new donations. How long do rewards last? Rewards last approximately (but not exceeding, save human error) one year, as they are currently handled manually. This excludes the banner reward, which will become available at the beginning of the next fight and be displayed throughout the month. What determines the order that people are listed as featured members? Featured members are ordered first by amount donated and then by how recently they donated. The person who donates the most will be the first one listed, but if two or more people donate the same amount, the person who donated more recently will be listed fist. ...a certain tier's benefits guaranteed for the entire 2020 event? In order to receive the benefits of a particular tier, you can start donating immediately following the end of the current Art Fight. If you wish to donate incrementally through the year to achieve a specific tier reward by the start of the next fight, you may choose to donate monthly. Be sure to budget out the amount you need beforehand! feedback on any of these is more than welcome! Have a suggestion? Let us know on Discord! If you have a problem with your donation or rewards, do not make a paypal dispute/chargeback. Instead, communicate with Takaia. All donors must follow the rules and ToS like any other user, and are not exempt from any consequences. ** The character you choose to include on the site banner must be appropriate, at the staff's discretion, and must not need a mask applied to them according to our maturity rules. You will be asked to choose a different one if it is deemed inappropriate. our gratitude. Every little bit helps! You will get the ‘supporter’ title. You will be featured on the featured members page.